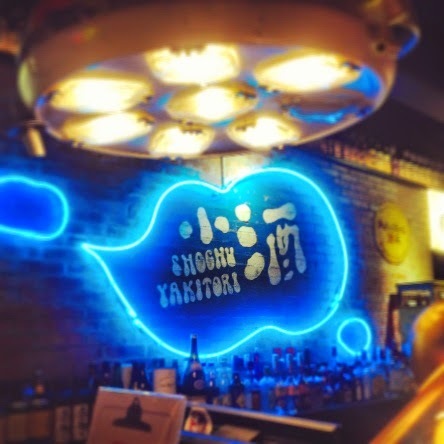 Appropriately located the the heart of the old distillery, know known as Huashan Creative park, Shochu Yakitori embraces the excellent atmosphere of it's surroundings to deliver an unique drinking experience. 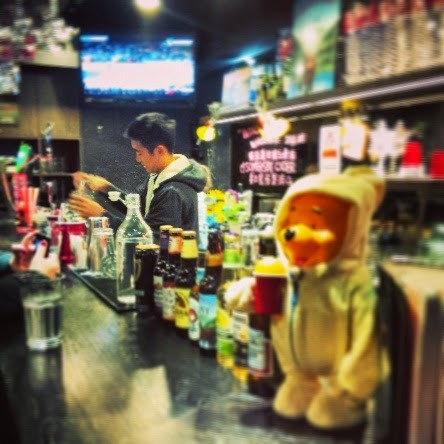 Shochu is a premium izakaya, a Japanese style bar serving food to accompany drinks. As it's name would suggest, the specialty is Japanese shōchū. Shochu Yakitori displays an impressive selection fine Japanese shochu along it's bar, as well as in the well stocked, glass walled cooler at the back wall. 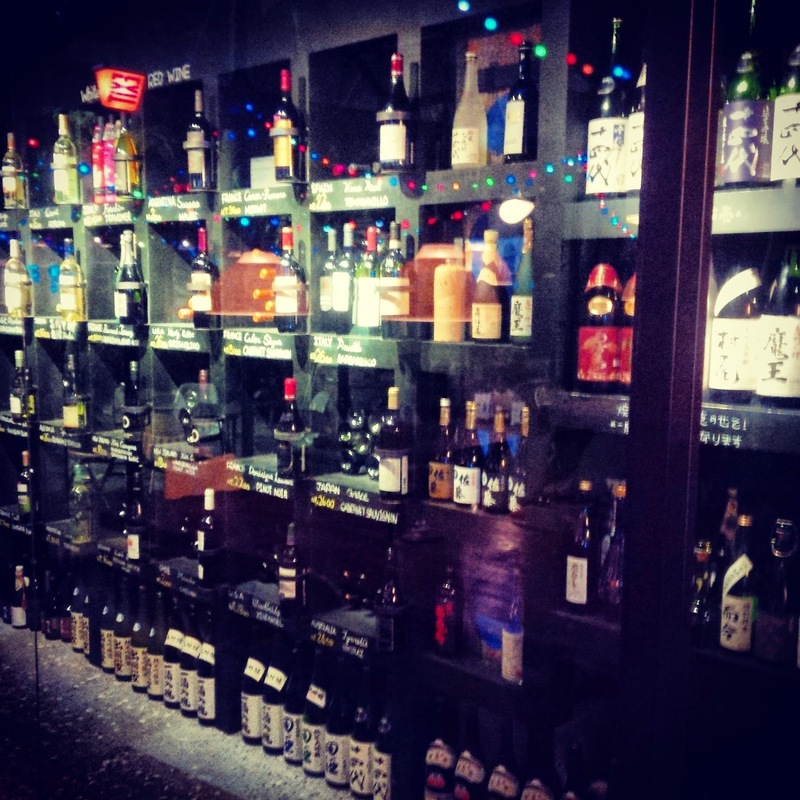 In addition to the range on shochu, other Japanese alcoholic options, from sake to fine whiskey are on offer. They also maintain a good selection of Japanese craft beer, to complement the Orion lager on draft. While Shochu Yakitori's stylings are atypical of a traditional izakaya, they provide a gritty ambiance suitable for a night of drinking and debauchery. The bar is lit by surgical lights, straight out of the operating room giving off a pleasant, yet somewhat eerie glow. Overall, the bars interior is impressive, what's even better is the pleasant outdoor patio, which can be a hard thing to find in Taipei. 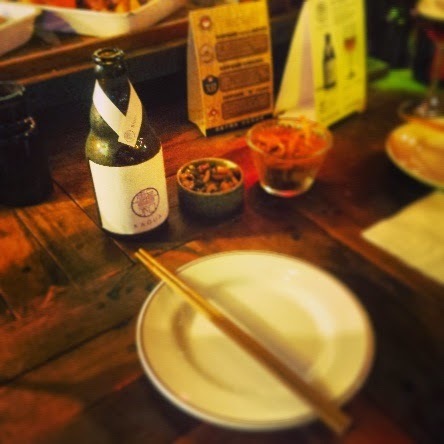 Shochu Yakitori is a splended Japanese bar and a great place to have some tasty snacks to alongside some tasty drinks. Have you been pining for those past days of college life spent in a a dingy basement, throwing dirty ping pong balls into cheap red-plastic cups? Then Pregame is the place for you! 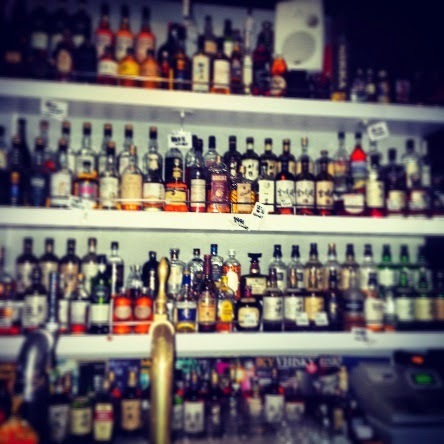 While it's ground level may seem like a familiar cozy American bar, the basement is anything but. Long narrow tables span the length of the windowless basement, that more closely resembles a frat-house than a bar. These tables serve only one purpose, to act as the battle grounds for the most famed of American drinking games; Beerpong. 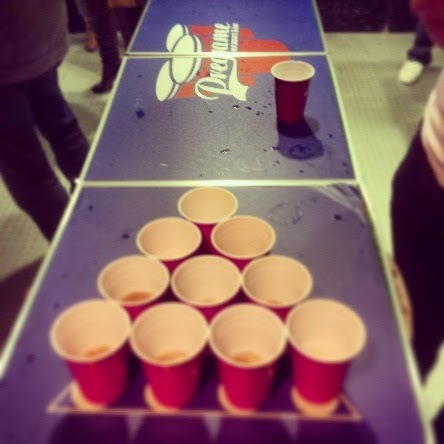 Pregame promotes American college drinking culture, allowing it's customers (with a minimum $200NT purchase) to try their hand at embarrassing/inebriating their opponents by tossing ping pong balls into plastic cups, while embracing the atmosphere of an American frat-house basement. 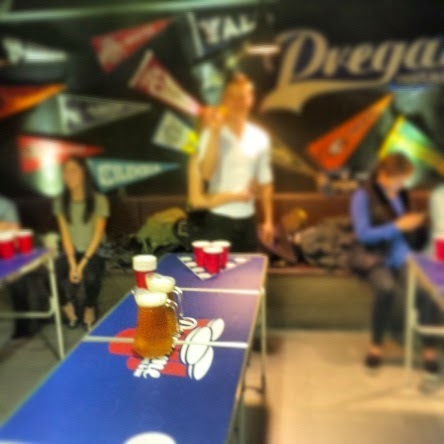 Pitchers of beer start at just 400 (for Carlsberg), and that's enough to partially fill you team's 10 red plastic cups for for one round of pong. (One unfortunate note about the beer is that, when we last visited, the draft beer had some off flavors, likely due to the beer tap system being improperly cleaned.) Pregame, does however, also offer imported bottled beers from well known Japanese and American craft breweries. 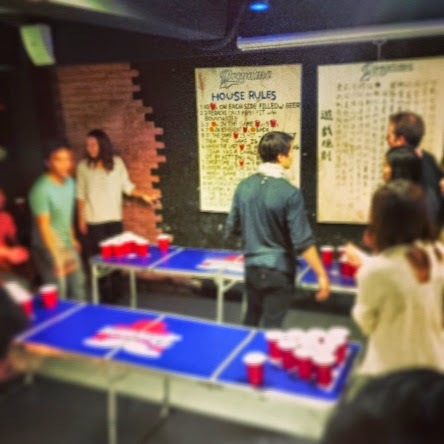 Pregame's unique concept makes it a must-visit for any foreigner or local in Taipei wanting to experience an authentic American college atmosphere. In the heart of Linsen North Road's Japanese entertainment district, Wa-shu is a renowned drinking den serving fine Japanese beer and spirits to tourists, travelers and local Japanophiles. 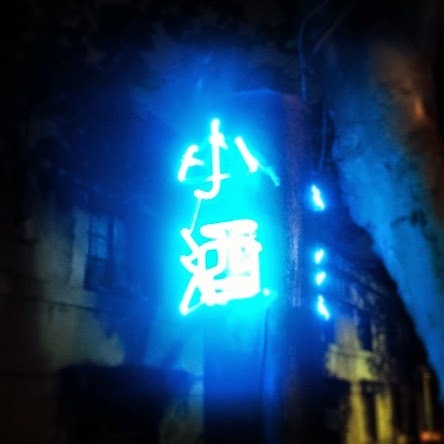 Wa-shu is a small dimly lit bar, with much of the available light flickering off the flatscreen TV on the backwall and glowing from the glass-fronted refrigerators. However, the bar's decor and lighting are not what brings in thirsty customers night after night. 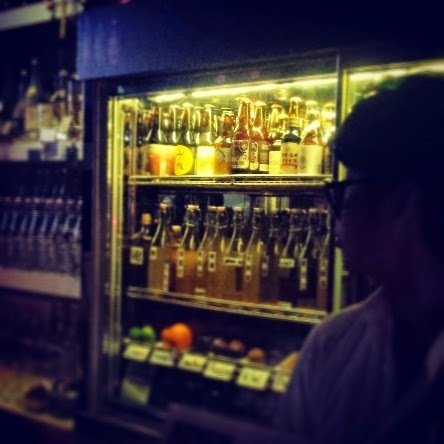 Inside the iridescent refrigerators and crammed into every corner of shelving that surrounds them, is Taipei's best selection of fine Japanese beer, whisky, shochu, and sake. Wa-shu seeks to educate it's customers and promote Japanese drinking culture though well-informed bartenders and by hosting educational events, tastings and seminars. In addition to catering to local customers, Wa-shu also readily provides tourism information to visiting Japanese patrons. 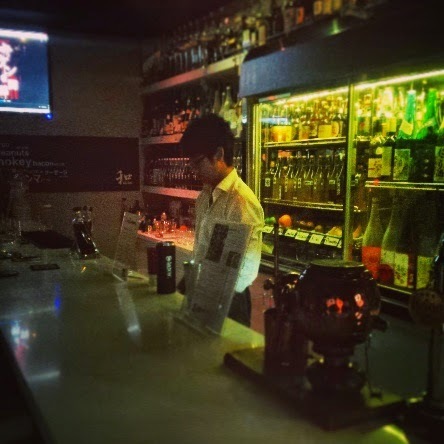 Wa-shu is must-visit bar for any beer or liquor enthusiast in Taipei, looking to try the best of what Japan has to offer.